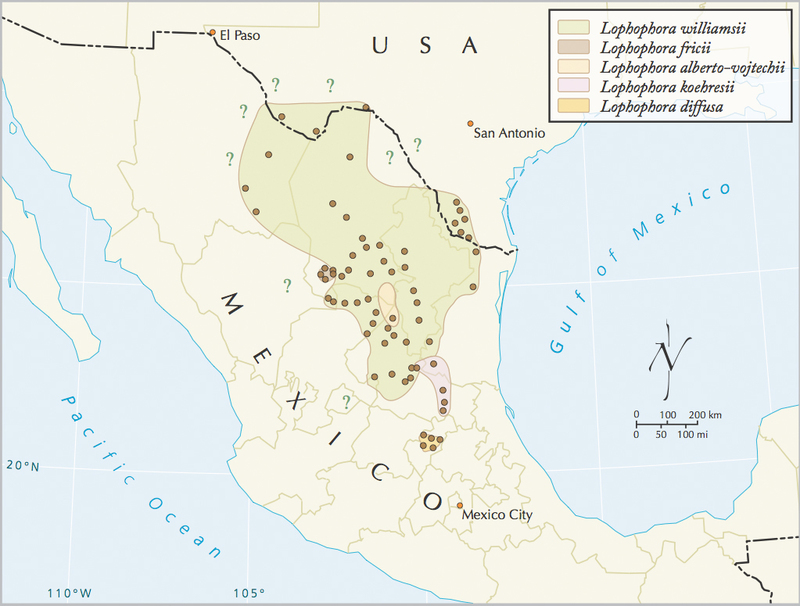 Below you will find an overview of the geographic range of peyote (L. williamsii) specifically and the range of the Lophophora genus in general. Lophophora williamsii (Lem. ex Salm-Dyck) J.M. Coult. (Cactaceae), commonly known as peyote, is a small, spineless, globular cactus native to the Tamaulipan Thornscrub and Chihuahuan Desert of northeastern Mexico and areas close to the Rio Grande in South Texas and Trans-Pecos Texas. L. williamsii is primarily a Mexican species, with over 80% of the land comprising its geographic range in Mexican territory. Curiously, in Texas the plant is restricted to a narrow strip of land that to a large extent follows the Rio Grande (and Texas is the only U.S. state where peyote occurs naturally; the habitat of the peyote cactus does not extend to neither New Mexico, Arizona, California, nor Oklahoma). Though peyote occurs in west Texas near Big Bend National Park, the most extensive area within the U.S. is from the mouth of the Pecos River southward and eastward nearly to Brownsville. The main area in which peyote has been harvested commercially is within Starr, Jim Hogg, Webb, and Zapata counties, primarily along the western Bordas Escarpment, the Aguilares Plain, and the Breaks of the Rio Grande. Over 90% of this land is privately owned and well-fenced. There has been discussion in the literature since the 1940’s about possible taxonomic differences between the Chihuahuan Desert populations and the Tamaulipan Thornscrub populations of Lophophora williamsii. Weniger describes the Trans-Pecos form, L. williamsii var. echinata as being a larger, tougher form of the species, not clustering to any marked degree, and as being much more tolerant to extreme temperatures, both hot and cold. Weniger also states that the echinata variety is said to have a higher mescaline content than the regular variety. A recent chemotaxonomic study by Hulsey et al. indeed shows a geographic variation in mescaline concentration in four different Texas peyote populations, with mescaline concentrations increasing significantly along a gradient from southeast to northwest, i.e., from the southeasternmost Tamaulipan Thornscrub population to the northwesternmost Chihuahuan Desert population. Currently the Lophophora genus is believed to comprise the five species L. alberto-vojtechii, L. diffusa, L. fricii, L. koehresii, and L. williamsii. The geographic range of the various species are given by the map below followed by a discussion of the biogeography of the genus. The genus Lophophora is one of the most wide-ranging of all the plants occurring in the Chihuahuan Desert; it has a latitudinal distribution of about 1,300 kilometers (800 miles). Within the United States L. williamsii is found in the Rio Grande region of Texas. 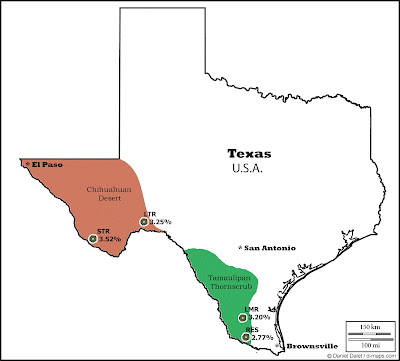 There is a small population occurring in western Texas near Shafter; it occurs in the Big Bend region, and then it is found in the Rio Grande valley eastward from Laredo. Peyote extends from the international boundary southward into Mexico in the basin regions between the Sierra Madre Occidental and the Sierra Madre Oriental to Saltillo, Coahuila; this vast expanse of Chihuahuan Desert in northern Mexico covers about 150,000 square kilometers (60,000 square miles). Just south of Saltillo the range of peyote narrows, is interrupted by mountains, and then expands again eastward into the foothills of the Sierra Madre Oriental and westward into the state of Zacatecas. It extends southward nearly to the city of San Luis Potosi where its distribution terminates. The southern population of L. diffusa is restricted to a high desert region in the state of Queretaro. This area of about 775 square kilometers (300 square miles) is isolated from the large northern populations by high, rugged mountains. high elevations even in the broad valleys. The relatively high desert area in Queretaro apparently is an isolated pocket of the Chihuahuan Desert. 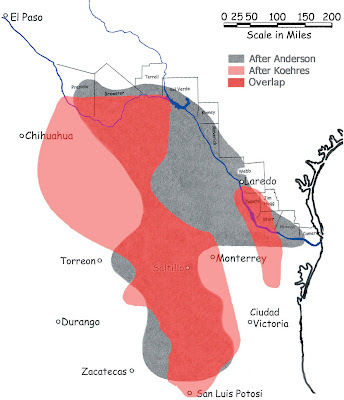 There are great elevation differences from the north to the south within the total range of peyote; the Rio Grande peyote occurs at an elevation of about 50 meters (150 feet), but in the southern portion of its range in the state of San Luis Potosi it is found at nearly 1,850 meters (6,000 feet) elevation. The elevation of the southern population in Queretaro is about 1,500 meters. 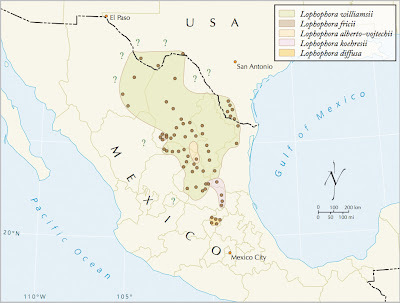 Terry (2008) describes the above map as "the most accurate (based on a rigorous requirement for documentation of localities) and phylogenetically complete distribution map for the genus Lophophora now available. It is based on documented voucher specimens (brown dots) from the UNAM database supplied by Héctor Hernández, Billie Turner’s Atlas of the Vascular Plants of Texas, personal communications from Gerhard Koehres, Jaroslav Bohata, and Jürgen Menzel, my own field observations, and herbarium specimens I have personally examined. Older maps tend to portray the range of L. williamsii as being more extensive, particularly with regard to the placement of its northwestern boundaries. Such marginal regions are indicated by question marks in the present treatment due to the lack of voucher specimens."